It’s snowing today outside the Crystal Clear Resources office, which always makes us want to stay inside and curl up with a good book (and tea or coffee, although we have debates within the company as to which is a better cold-weather beverage). So, naturally, we thought that today would be a perfect day to unveil our December reading list, packed full of fantastic books to read in any weather! Our first pick is Home Fire by Kamila Shamsie, which masterfully retells, deconstructs, and revivifies the Ancient Greek story of Antigone, capturing the intensity of Sophocles’ tragedy with a language and trajectory all Shamsie’s own. Next is A Lovely Way to Burn by Louise Welsh. We promise that there isn’t a prevailing “heat” theme since it’s such a cold day outside – the book is simply too good to pass up adding to the list. As millions of people are dying from a pandemic called “the Sweats”, it might just be possible that one of those deaths was no accident. If you enjoy dystopian literature, with a hefty dose of mystery and thriller elements thrown in, A Lovely Way to Burn is a lovely way to spend an evening. Killers of the Flower Moon: The Osage Murders and the Birth of the FBI by David Grann (who also wrote The Lost City of Z!) is a nonfiction tour de force about the murder of dozens of Osage people in Oklahoma. When those who attempted to investigate the crimes started turning up dead, the FBI, a relatively new agency at the time, took over to investigate the bloodshed and unveiled a disturbing conspiracy. For lovers of American history, true crime, or mysteries, this book is a fantastically chilling read. Our fourth pick is Love & Math by Edward Frenkel. Written by a skilled mathematician, Love & Math unveils the beauty in mathematics and explores how mathematics creates beauty and magic in the universe around us. If you aren’t already a lover of math, this book might just convert you. 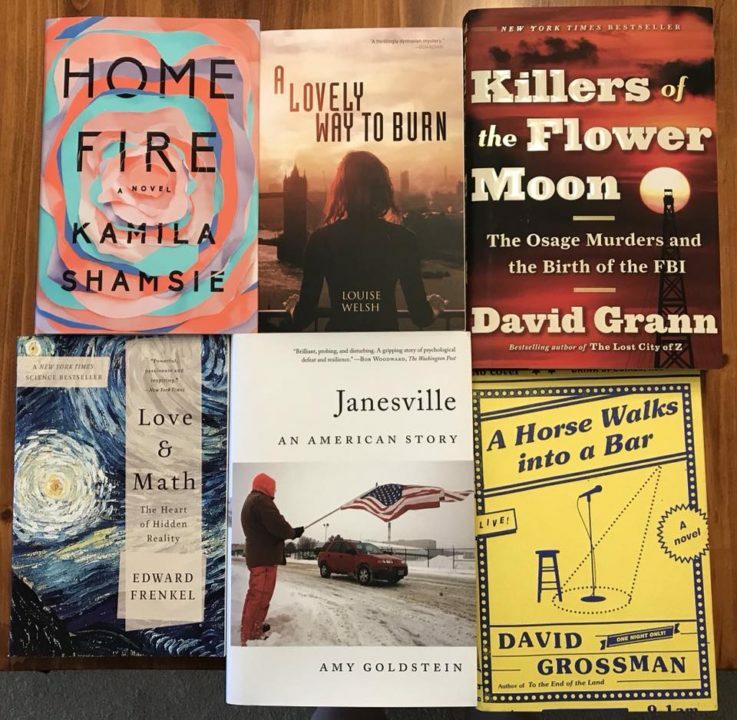 Then we bring our list back to Wisconsin with Janesville: An American Story by Amy Goldstein. Centered around the closing of the oldest operating General Motors assembly plant during the Great Recession in 2008, Goldstein explores the profound human impact, as well as the political and cultural ramifications, that the removal of a vital factory has on an industrial town. Lastly, we revisit A Horse Walks into a Bar by David Grossman. Grossman’s book is about the life of a stand-up comic – a little past his prime – examined through the lens of his performance as it unfolds through the course of one evening, oscillating between hilarity and memory and back again. We explored this book a few months ago during a discussion about the difficulties involved in expressing humor within a translated text. Jessica Cohen is a masterful translator who acutely recognizes and compensates for some of those difficulties and she helps make A Horse Walks into a Bar as impactful in English as it was in Hebrew. Here is a link to the New York Times article that we initially presented in June 2017. Join us next year for our January 2018 book picks! As always, please send us any new books – we love adding them to our ever-growing collections!